Medical update: I'm healing well. It's slow. The incision looks good, as you can see here. Still bored. It's funny - when you're forced to sit around and not do active things, all those things you usually enjoy because it means you don't have to move (tv, knitting, reading) get boring very quickly. I've been working puzzles. Here is my favorite old puzzle from my childhood - the map of Ohio. Cool, huh? Here is the Pennsylvania puzzle. Also very cool . . . but it's not Ohio. And . . . Simon, a HUGE fan of Firefly, and especially Wash, was gifted this fabulous hand-made Wash Sweater from our friend, Don, who charted the pattern by hand from the show. Don doesn't like the striations in color and the fit of the sleeves, so it is now Simon's. 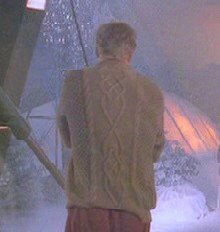 But get this - Don is actually THE person who charted the cable pattern that EVERYone in the world will use for the Wash sweater. He's a genius! It fits him well right now - if he develops bigger biceps it will need to be altered, but it has plenty of length to last him a few years, I'm sure. Thanks, Don! Simon is THRILLED, AND EVEN WORE IT TO BED! This is so very generous of Don! Thank you so much!! Don, Gerry and David came over tonight - it was so nice to sit, chat and knit. Yay! oh, man! i totally want that ohio puzzle.